Giving your dog their flea and tick treatment is now a real delight with revolutionary NexGard! From the makers of Frontline is NexGard, a flea and tick killer that truly is one of a kind. Using a brand new ingredient, afoxolaner, it works quickly and effectively to treat and keep fleas and ticks at bay. NexGard is also a hit with dogs because it's the first flea and tick treatment to come in a delicious beef flavored chew which dogs love to eat. 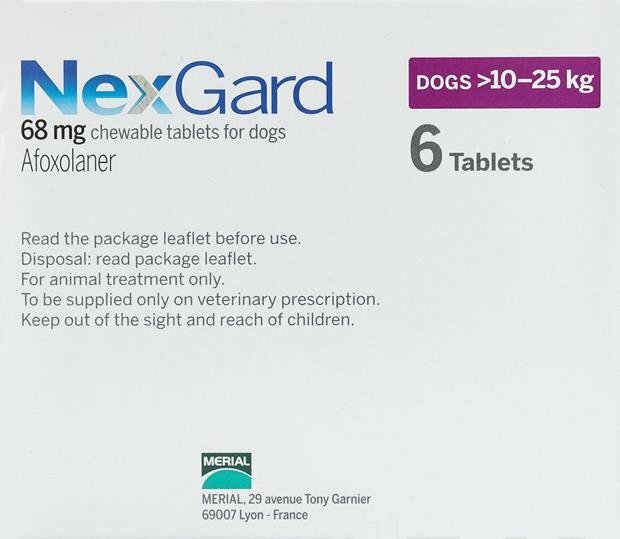 Upon consumption, NexGard is rapidly absorbed into your dog's bloodstream and begins to attack any flea and tick's central nervous system as well as preventing them from laying any eggs. NexGard is excreted through your dog's metabolism so they are consistently protected for 30 days. NextGard is FDA approved and highly recommended by vets and can be taken in conjunction with heartworm treatments. NextGard is clean and easy to administer so you no longer have to rely on messy topical applications, giving you peace of mind knowing that your dog has received and consumed the treatment they require and are fully protected from nasty fleas and ticks. Nexgard treats ticks and fleas. how much does the package weight ? how many days does it take for the procDuct to be delivered? It usually takes 10 to 15 working days to arrive. If your dog around 60 lbs , it should be ok to give this to him. However we always recommend you get advise from your vet before administering any medication. Are there 6 pills in a six month supply? One per month? My dog has shown adverse reactions to Comfortis, I won't use topicals so we tried Nexgard. No side effects and no fleas! Very happy with this. I rely on this every month to keep the fleas away and my dogs just think they’re getting a special treat. We got the ticks but our dog had no problem at all and was the exposed..